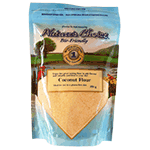 Enjoy this great tasting flour to add flavour and valuable nutrition to your diet. Hypo-allergenic coconut flour has a pleasant flavour that’s slightly nutty and mildly sweet without a strong “coconut” taste. Cup for cup, it provides more protein than wheat flour and ten times more fibre, most of it the healthy soluble type. It is lower in carbohydrates than any other flour, plus, it contains lauric acid, a fatty acid found in mother’s milk that possesses antiviral, anti-fungal and antimicrobial properties.